Information taken from the Canada 2001 Census.. Mother tongue in Prince Edward Island (red: English, blue: French). The only part of the province to have a Francophone majority is the so-called Evangeline Region. The 2006 Canadian census counted a total of 4,785 immigrants living in Prince Edward Island. The Roman Catholic Diocese of Charlottetown comprises the entire Island and is the second oldest English diocese in Canada. The Archdiocese of Kingston is the oldest. 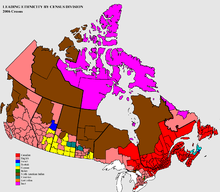 ^ "2006 Canada Census: Community Profiles". Statistics Canada. March 13, 2007. Retrieved November 3, 2017. ^ "2006 Census: Aboriginal Population Profile". Statistics Canada. January 15, 2008. Retrieved November 3, 2017. ^ a b "PEI 2001 Canadian Census". Archived from the original on 2007-03-23. Retrieved 2007-01-29. ^ "2006 Census of Canada: Topic-based tabulations". statcan.ca. Retrieved 4 July 2015. ^ "2006 Census of Canada: Topic-based tabulations". statcan.ca. Archived from the original on 11 February 2009. Retrieved 4 July 2015. This page was last edited on 17 February 2019, at 01:49 (UTC).